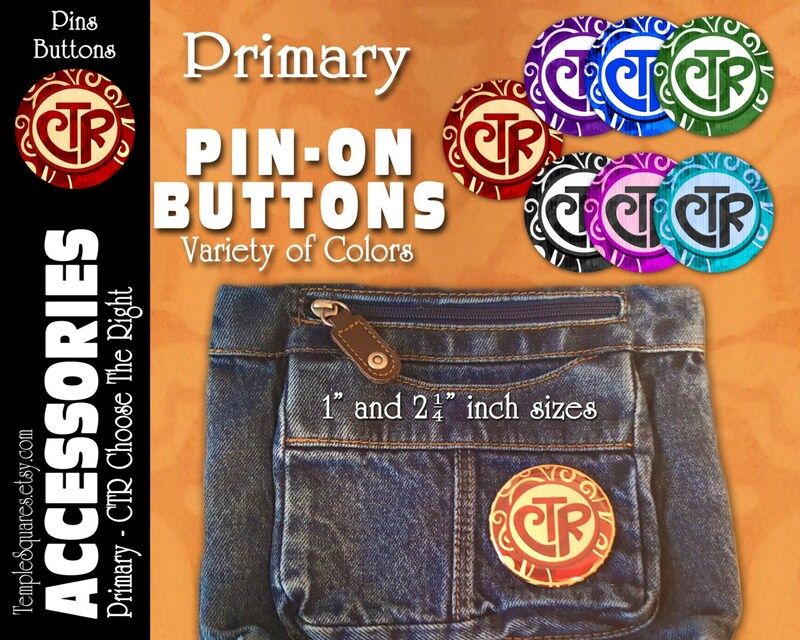 CTR Choose The Right Primary Pin-On Buttons Theme. Several Colors Available. Great for Scripture Bags, and Backpacks. 2 sizes. 1" or 2-1/4" sizes. Fun for all occasions: Birthdays, Christmas Stocking Stuffers, Missionaries, Children, Primary, Great to be Eight Baptism Preview, Girls Camp, Secret Sisters, Relief Society, Visiting Teaching, YW Young Women, Youth, Young Men, Presidency, Teachers Appreciation, Sweet inexpensive gift for any occasion. You can choose a single color or mixes of any. Add note when ordering if you have specific numbers of each color.